Fat reduction with BodySculpting will be performed on many areas of the body. During your initial consultation, we will fit the applicator to the area of the body you wish to treat. Through this process, we can determine if this treatment will be a good treatment for reducing the collection of fat that is noticeable to you. In Spa Jaco the treaments are personalized for every body condition wich incluide Suitable to firms and tightens sagging : Give tone and firm your buttocks , chest, abdomen , arms, etc . Your body rejuvenated and refurbished. Cellulite out and Sculpt your body contour by increasing muscle tone having sagging. It is ideal for sagging problems and lack of tone in the muscles: Eliminate localized fat without surgery. Rather than using invasive techniques, Healing Arts utilizes radiofrequency or ultrasound energy, which goes through the skin to break down areas of excessive fat cells in the body. The innovative technology also tightens and contours the overlying skin, to improve the appearance of the body in areas that are resistant to diet and exercise. There is now a safe, painless, and effective option for removing fat and improving the contours of the body, that does not require surgery or anesthesia. Technology enables low-frequency ultrasound to treat selectively producing fat cells without damaging breakage surrounding tissues. The system is very selective, ensuring that the objective is subcutaneous fat and not another. This is the best fat removal procedures and one of the most innovative technologies that has been introduced for non-surgical fat removal. Without downtime or pain, the Treatment breaks up collections of fat cells under the skin that do not respond to diet and exercise. RF has an effect molding of tissues by stimulating the fibroblast, the cell responsible for the production of new collagen fibers. Additionally, it has a lifting effect by shortening the patient collagen fiber. By the rotation of the triple helix structure provides electromagnetic radiation selectively delivering energy in the deep dermis and subcutis. Sculpting your body is a safe and effective method of non-invasive fat reduction. Allows for the removal of excess fat in specific areas of the body, without the need for anesthesia or lengthy downtime. The Cosmetic Treatment takes only one hour and results in a 20% reduction of fat cells in the area treated. This translates to dramatic improvement in the appearance of your body, removing that stubborn pocket of fat that diet and exercise can’t see to get rid of. Thus the lymphatic system to work faster in the processes of reconstruction of injured tissues and facilitates the departure of some fluids can accumulate after the operation is activated. Treatment with (DLM) never cause pain or even discomfort, even when working on tissue edema. In Jaco Spa we convined therapeutic techniques to help you recover faster. The electrical impulse that signals almost equal to that produced by the brain. A movement causing involuntary relaxation and contraction. Its effectiveness is that its mechanism is based on the same principle of voluntary muscle movement. Empty adipocytes: Fat cells are separated and nodules are undone.Draining action: Removing dissolved fats and waste from the body. Work the muscles eliminating accumulated fat in this area. Reaffirms muscles. The result is a firmer skin without sagging. It relaxes and reactivates blood circulation. By applying ultrasonic waves, occurs on the treated area increased temperature, this heat causes increased local blood circulation. The mechanical action occurs when the very high frequency oscillating particles to generate a release adhesions of fibrosis, and the chemical action is enhanced because it allows activation of the oxygen molecules, generating an increase in fat oxidation, producing enhanced release of energy, which involves a considerable increase in temperature. Cryotherapy is the application of cold on the body. Its main effects on the body are: vasoconstriction, analgesia, anesthesia, anti-inflammatory, decreasing the blood supply to a particular place and raises blood pressure. Bags or bandages are used, not directly on the skin not to cause a burn. 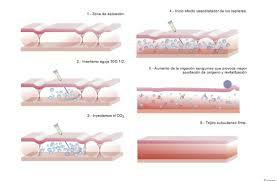 Integrate the principles of moxibustion, shiatsu, and acupuncture plus Thermoteraphy for tightening is a non-invasive treatment that stimulates the production of the skin’s own collagen. The result is tighter and firmer skin on the treated area. This is an excellent treatment for contouring and tightening; in fact, many people find that having a Thermage treatment allows them to put off the facelift they may have been considering. Thermage is used to treat both the face and body, allowing for tightening and contouring on the face, and tightening and improvement of skin texture on the body. A single treatment is all that is necessary for very long-lasting improvement. 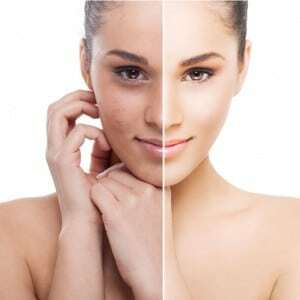 Using a convination of treatments (radiofrecuency, diodo laser, microdermabrasion) Which ensure skin renewed, invigorated, healthy in all ages and in various skin problems causing minor injuries such as loss of elasticity, sagging and breaking result epidermis leaving scars (striae ), accumulating excess water and fat tissues, causing rupture of vessels (spiders) and obstructing the movement of the foot. The face on the back, along with acne extractions (removal of blackheads and whiteheads), offer immediate results and long-term benefits. Auriculotherapy is part of Oriental medicine, ear acupuncture can define as the science of complementary medicine that deals with the diagnosis and treatment of disease by stimulating points located in the ear, to obtain a therapeutic result in the patient.Indicated for weight loss, stress.